Big thanks to the talented (and patient) Yann Novak for his elegant design. And many thanks to everyone who made all of this work possible, especially Loren Robertson and her video skills, and my talented (and very patient) husband, Marc. Still musing on fond memories of that time someone taught you the Hustle? 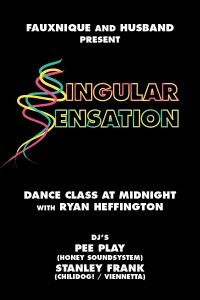 Then you will LOVE Singular Sensation! I went to Sir Heffington’s club, Fingered a couple of years back in LA – same format: sweaty dance class followed by exuberant dance party – and watched every ounce of cynicism drain from my body. Join me. On June 11th, I walk the runway in Threadbare, the Lab’s annual fundraiser/striptease/auction. Innovative local designers auction their clothing straight off the models’ bodies. For ART. 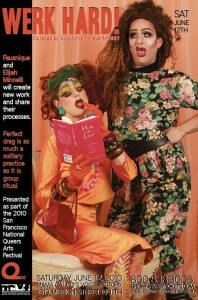 Vivvyanne Forevermore curates an experiment in collaboration as part of the National Queer Arts Festival. And finally, in addition to all of the amazing accolades and honors I have received this year (a GOLDIE for performance and Readers’ Poll award for drag, both from the SF Bay Guardian, and 7×7 Magazine’s Hot 20 Under 40) I was chosen as Best Performance Artist in the SF Weekly’s Best of 2010. I also finally made it into in the society pages. And many thanks to all of you.